I blogged once before about this stair landing. I’ve blogged before about our bicycle-themed kitchen. Previously, we had pulled off some of the old mouldings, painted them red, and put them back on. Unfortunately, a lot of them were cracked and just generally in crummy shape. We should have replaced them last time, but we didn’t. So we did it now. 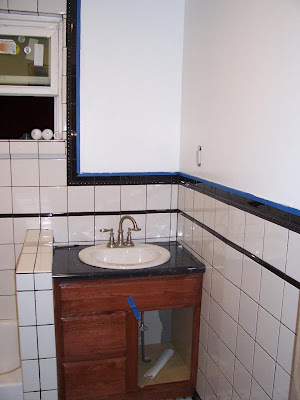 So only my longest of readers will recall when we did some bathroom reconstruction back in early 2009. We finally got around to finishing the last task, which turned out to be way easier than we were expecting. 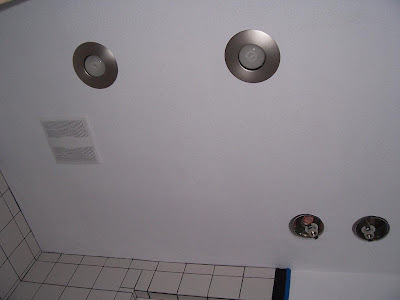 Back in 2009, we had been a little bit sloppy cutting out the holes for our recessed lighting canisters because the fixtures we were planning to use had huge overlap to cover it up. Turns out though, the dude at Home Depot had sold us the wrong canisters for the fixtures we wanted to use, so we had to switch to fixtures that weren’t nearly as generous in covering blunders. So for the past year, this huge gap between the light fixture and the edge of the ceiling has been visible. But we finally got it patched and painted. The bathroom project is finally done! So that’s about it. That’s what we’ve been up to. So we’ve finally finished the bathroom remodel project (except a few odds and ends…) so I thought I’d post some before and after photos. First, the before pics. When we first moved in, this is what it looked like: a gaudy, gold set of lights above the vanity (the medicine cabinet door smashed into the light bulbs any time you opened it). Notice how the electric conduit is outside the walls… and remember the full-size wall around the shower that left the vanity in a little cubby-hole? and the full-size window in the shower??? During a mostly unrelated electrical project in the house, I moved all the electric lines inside the walls (where they’re supposed to be). I also painted everything a very deep green color on a whim, which I still like, though Mel assures me it was a poor decision. I replaced the light over the vanity with the Home Depot $8.99 special, which is nothing fancy, but at least the medicine cabine door didn’t swing into it anymore. We added a new, larger vanity (30″ vs. 19″). Notice the little half-wall, which makes the whole room look & feel larger. Of course, big thanks to Blayne for all the time and effort. We couldn’t have done it without him. It’s not often when someone is willing to take 10 full days out of their schedule to work on your house for free – and then want to take you out for dinner when they’re done. Here’s a photo of the new vanity and some of the wall tiles – newly grouted as of yesterday. And here’s a photo of the finished ceiling and a couple of the recessed lights. We’re a little bit angry about the two lights above the vanity (the two without any lights in them right now..). The guy at Home Depot helped us pick out our lights and the canisters – AND THEY ARE INCOMPATIBLE. THANKS A LOT HOME DEPOT GUY. So we had to order those lights online (because now that we have the canisters already installed, we are limited only to lights compatible with the canisters – which are all online order only…) SIGH. We’re so happy with how it’s turning out! BIG THANKS to FIL who pretty much did the entire job for us. Couldn’t have done it without his time, effort, knowledge, or tools. We owe him BIG TIME. SIL is coming to visit on Sunday, and Pie Party is looking like it’s going to be Monday, so we’re hoping to have the vast majority of it done by then. I have a recommendation for anyone who plans to do any tiling in the near future: use the largest tile possible. Seriously. 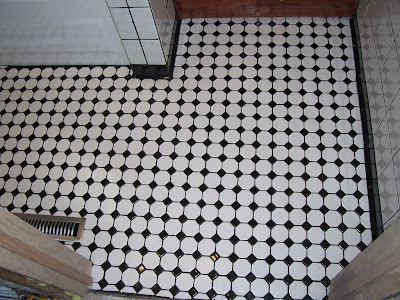 If you can find one giant-sized tile large enough to fill the whole room, use it. Really, though, our tile floor is gonna look awesome. We finished placing the tile last night at 2:00 AM. And I’m pretty sure we did a relatively poor job, but I still think it’s gonna look pretty derned good. We didn’t estimate how many tiles we would need very well, so we actually had to pull up some tile that we had already placed underneath where the vanity will be to put them somewhere else. So we’re moving right along with the bathroom remodel project. Hopefully within two weeks we’ll be finished and we can spend the rest of the summer trying to clean the dust off everything else in the house. Here’s an older photo from a few days ago – we’ve got the insulation in the walls and the plastic up. Here’s some photos from today: We’ve got all the walls up & two layers of mud on the drywall. Sorry the photos are all a little too close-up to get a good look at the whole project, but the room is so small… you can’t hardly take a photo of anything in there. Here’s a shot of the ceiling, we’ve chosen some recessed lighting that we’re pretty excited about. Here’s where the vanity will be once we finally get it in place. Here’s a good shot of the new window, our half-wall, and our wee-little tub. This afternoon we’ll sand the drywall, put more mud on, maybe sand again tomorrow. Maybe tomorrow we can put the primer on the walls, and Tuesday put the first coat of paint on the walls & ceiling. Second coat of paint Wednesday. 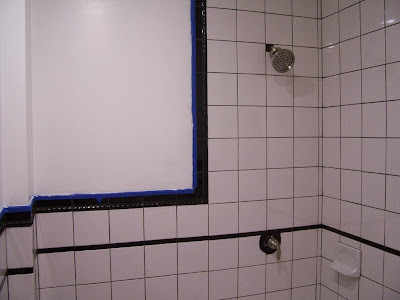 We hope to have the tile work done by the end of next weekend – then it’s just finish work like putting up trim, hanging a couple shelves & towel racks. 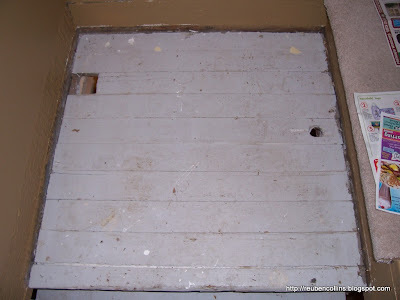 0k, blogger friends, here’s an update on our life-consuming bathroom renovation project. This first photo shows the new window in place. Also notice all the new framing in the wall! Next up, just a photo of of the floor joists…. 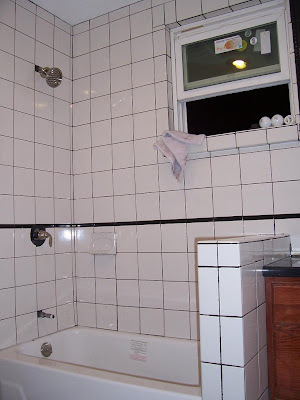 Last photo is of the toilet – perched on an island of tile still left in the corner of the room. No sense taking the toilet out before you really need to, right? Ok, these photos are a day old – the toilet is now gone (replacement: 5 gallon bucket – don’t ask…) We’re trying to get the floor in place, now. The goal for tomorrow is to have the floor in place and the drywall on the ceiling. Mel and I were talking today about how much more difficult this project is because our house is so old. We’re spending so much time dealing with all the complexities of old houses – the sort of stuff you don’t really encounter while remodeling a newer home. For example, our demolition was way more difficult because of the old lathe & plaster walls – we also had 3 old layers of flooring to remove -our floor joists are really uneven because of 100 years of settling – we’re always cutting out old, abandoned pipes – nothing is square since the entire house has been settling for 100 years… etc.. But we think we’ve finally reached a major milestone. From now on, we’ll be putting more stuff back into the bathroom than we’re removing! That’s a good sign. Anyway, we’re so excited for it to be finished. It will probably take us a few more weeks to finish! Problem #1… the location where all the old plumbing vents are supposed to connect to the main stack is completely rusted through and no longer connected. Not sure how we’re gonna fix this, but it might involve replacing part of the main plumbing stack…..
Up until now, Mel and I haven’t had any overhead lights in either of the bedrooms. We’ve just been using floor lamps. Well, I strongly dislike floor lamps in general, and especially the really cheap ones we were using. So I decided to install some overhead lights. The problem: there’s no electricity overhead, no switches on the wall. So I put it in. TA DA! Our old home has a dusty old attic, so there was plenty of room to crawl above the bedrooms and string electrical wiring about. The hard part, of course, was trying to get a live wire into the attic in the first place. I didn’t want to have to knock down any walls or anything in the bedrooms to access the existing wiring behind the walls. Notice the electrical wiring is outside the walls. Maybe you can’t really see it in the photos, but one of the walls is covered in cheap faceboard – hiding scary things underneath. And the light fixture above the sink is awful. Well, since I was going to have to rip a little bit of the wall out to get at the wires underneath anyway, we decided to fix it up a little bit. We didn’t want to do anything fancy since we’re planning on ripping it out anyway, but I’ve got plenty of hands on my time. I chose the color myself. Green is my favorite. Mel didn’t know I was going to do any painting, so it was a surprise to her. I would have discussed it with her, but I figured we’re going to destroy it soon anyway. She says she likes it. Notice that the wires are now inside the wall. The project was a success. We now have overhead light fixtures in both bedrooms, controlled by switches on the wall. It’s like we’re entering the 1930’s. SWEET. I was surprised to find out while crawling around in the attic, that our home was originally constructed with a gas line routed directly above each bedroom, presumably to feed a gas light of some sort. Interesting stuff.